Had Andy Griffith lived one day longer, he would have died on the 4th of July. This seems fitting for a man as American as apple pie, yet his simple modesty would never have allowed it. Thus, Andy Griffith passed away last week on July 3, one month into his 86th year, leaving a monumental contribution to American culture behind him. He was best known as an actor, playing the straight-man, small-town Sheriff Andy Taylor in the eponymous television show he helped create – and with it an entire world. His childhood was rich with storytelling and, especially, music. The eccentric residents of the fictional Mayberry were inspired by the colorful characters that peppered his childhood in Mount Airy, North Carolina. While it is true he grew up dirt poor in the small southern town, even reduced to sleeping in dresser drawers as an infant, Andy Griffith was no bumpkin. In 1949, the ambitious and multifaceted Griffith graduated from the University of North Carolina at Chapel Hill with a Bachelor of Music, where he served as the Men’s Glee Club President. 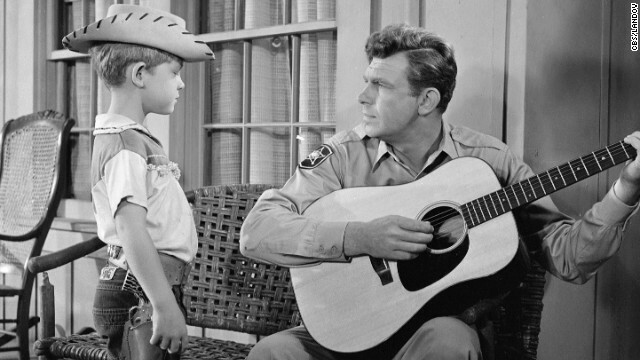 Music played a key role in the original “Andy Griffith Show,” which ran from 1960-1968. The Sheriff could often be found pickin’ a guitar on the front porch of a summer evening, but things really started to cook when the Darlings came to town. The Darlings were a fictional mountain family who came into Mayberry occasionally and usually stirred up trouble. They were also a family string band, played on the show by the real-life bluegrass band The Dillards – consisting of brothers Doug and Rodney Dillard as well as Dean Webb and Mitch Jayne – and augmented by character actors Denver Pyle as the patriarch and Maggie Peterson as sister Charlene. The Darlings made six appearances on “The Andy Griffith Show” between 1963-1966 and each appearance featured one or more musical numbers, which usually began with a list of objectionable song titles until everyone could agree on one to pick. Andy often sat in. The characters on the show were backwoods hillbillies but, in real life, The Dillards were an outstanding and highly influential band. True pioneers, The Dillards were among the first bluegrass bands to plug-in using electric instruments and incorporate outside material and styles into their traditional sound. This melding of styles and sensibilities along with their ubiquitous presence on the Southern California music scene of the 1960’s helped to create the sound that became known as “country rock,” exemplified by bands like The Byrds, The Flying Burrito Brothers and The Nitty Gritty Dirt Band. Doug Dillard, who passed away in May at age 75, was a banjo prodigy who collaborated with many notable musical giants, including legendary Byrds founding member Gene Clark, and toured with artists such as Elton John and Bob Dylan. Doug Dillard was in many ways a kindred spirit to the father of bluegrass banjo – Earl Scruggs – who preceded Dillard in death by less than two months. Scruggs, who was 88 when he passed away last March, revolutionized not only the way the banjo was played, but also the way it was perceived in modern popular culture. He took it out of the hills and into Carnegie Hall. Literally. And then to newer and broader audiences as he relentlessly fused traditional country and folk music with modern day sounds and ideas; covering four Bob Dylan songs on Flatt & Scruggs’ Nashville Airplane from 1968 (including “Rainy Day Women #12 & 35”) and beyond with The Earl Scruggs Revue. And like Dillard, Scruggs also found household-name recognition in a black and white television show from the early 1960’s featuring a clan of country folk. Each episode of “The Beverly Hillbillies” kicked off with Flatt & Scruggs’ “The Ballad of Jed Clampett” and Earl’s rolling banjo. It was a #1 hit. “The Andy Griffith Show” and “The Beverly Hillbillies” shared more in common than country families and banjo prodigies. They each used rural characters for comedic results without ever patronizing. This is incredibly difficult to do and will probably never be repeated in today’s vacuous, exploitative, lowest-common-denominator reality programming. Yes, the exaggerated colorful country characters in these two shows often found themselves in ridiculous situations and saying and doing ridiculous things, but at the end of the show, there wasn’t a sense of mockery, elitism or pandering. The characters in “The Andy Griffith Show” emerged from the adventures of each episode better people. True, Barney never really grew above his ego to learn from his mistakes, and Otis wound up in the drunk tank night after night, but there was a sense that these people lived admirable lives. “The Beverly Hillbillies” took this romanticism of simple life a step further by juxtaposing the Clampett clan against the soullessness of Beverly Hills. And it is not an unintentional side effect that when these two factions of society went head to head in dramatic conflict, it was the salt of the earth Clampetts who came out looking more sensible than the idle wealth of West LA. There may be something to the fact these three giants, whose careers were so circularly intertwined, returned to the soil within a few months of each other. Much is written these days about Griffith’s astonishing performance in Elia Kazan’s 1957 dark masterpiece A Face in the Crowd – and for good reason. His performance is stunning, chilling. Watching the promising yet relatively unknown stage actor’s work in A Face in the Crowd in 1957, one would think they were watching the next Brando, not the future Sheriff of Mayberry. A Face in the Crowd highlighted not only Griffith’s serious acting chops, but also gave him a chance to step outside of his comfort zone musically. “Mama Guitar” is a rockin’ little slice of pseudo-rockabilly with a tight rhythm section, stratospheric guitar leads and an aggressive, cynical vocal that’s a far cry from the homespun mountain music of The Darlings. What more should one expect from an itinerant musician named Lonesome Rhodes? Griffith’s biggest musical success, in terms of sales and accolades, came in 1996 with the release of a collection of traditional Southern Gospel hymns and standards such as “Amazing Grace” and “Precious Memories.” I Love to Tell the Story may be a bit too polished and saccharine for some, but it certainly was an earnest effort by Griffith who has a genuine affection for these songs and was clearly a hit with its intended audience, selling over half a million copies and winning a Grammy for Best Southern, Country or Bluegrass Gospel Album in 1997. Despite the Grammy-winning gospel album and the recurring appearances by The Dillards as The Darlings, when one thinks of “Andy Griffith” and “music,” one thinks of finger-snaps and a whistle. The iconic opening sequence of “The Andy Griffith Show” begins with that now unmistakable whistled melody, accompanied only by the sound of snapping fingers keeping time and, eventually, rhythm guitar and upright bass that come in practically on the fade-out. The man doing the whistling is Earle Hagen, who wrote the theme, entitled “The Fishin’ Hole,” with Herbert Spencer. A voice-over announces, rather superfluously, that this is “The Andy Griffith Show, starring Andy Griffith.” The visuals are equally iconic: Andy and his son Opie walking down a wooded lane, fishing poles slung over their respective shoulders. Andy is in full uniform and Opie has his dungarees rolled up well past his ankles, looking like a sort of mid-century Huckleberry Finn. The setting itself is immediately familiar to us, even if we’re not sure why. 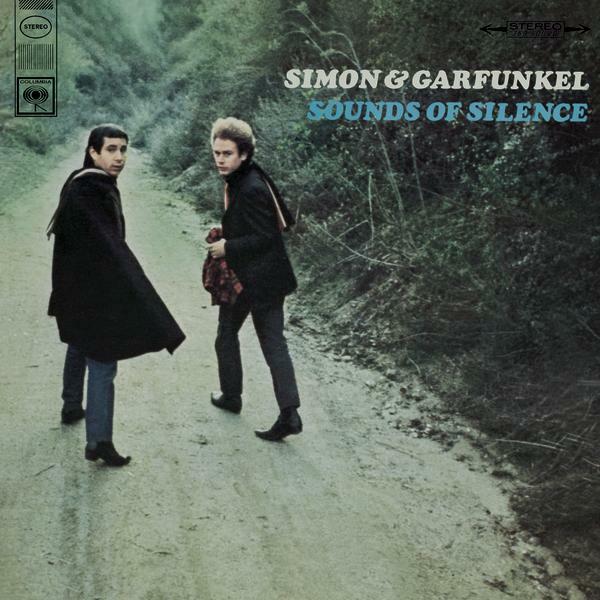 The sequence was filmed in Franklin Canyon Park, which is in the Santa Monica Mountains north of Sunset, near Beverly Hills. The actual Franklin Lake stood in for the fictional Myers Lake. The spot has been filmed and photographed countless times. It can be seen in the memorable hitchhiking sequence from Frank Capra’s 1934 multiple Oscar winner It Happened One Night where Claudette Colbert’s leg shows up Clark Gable’s thumb. 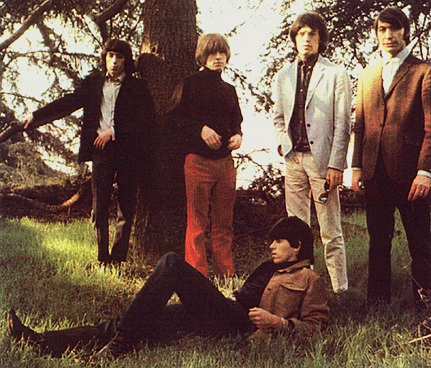 Photographs of the lake and the park dominate the cover and inside spread of The Rolling Stones’ 1966 collection Big Hits: High Tide and Green Grass as well as the landmark Simon & Garfunkel album Sounds of Silence, also from 1966. Griffith released a full-length vocal version of “The Fishin’ Hole” with lyrics by legendary actor Everett Sloane, which describe the virtues and pleasantries of simple country life. In fact, the lyrics capture the spirit of the show so perfectly they are unnecessary. We already sense just from watching Andy and Opie walking around near Franklin Lake on what looks like a warm and pleasant summer day that this is a good spot for fishing, skipping stones and drinking lemonade. Sloane’s lyrics really don’t bring anything new to the equation and although Griffith’s vocal exudes all his homespun southern charm, the two-minute vocal version is not nearly as powerful, endearing and lasting as the 20-second instrumental theme used to open the show. Here, the narrator and Opie are wandering around the backwoods looking for kicks while high after smoking some of Goober’s homegrown marijuana. They end up by the duck pond where they stumble upon Otis’ moonshine still and where they graciously accept his invitation to have a jar, in exchange for some of Goober’s weed. Ernest T. Bass makes an appearance and, of course, Barney Fife shows up at the end to bust the whole party but instead ends up staying and having a puff. All this activity much to Andy and Aunt Bea’s chagrin, naturally. One would think this unorthodox tale might seem sacrilegious to fans familiar with the wholesome values extolled by the television show, yet the song is so playful, the references so specific, the characters so true, it feels more like a tribute than satire. It’s clear the songwriters are genuine fans and, in an odd way, the whole ridiculous episode fits right in with the show’s original vibe. Kurt Cobain offered his own dark retelling of the characters and settings from “The Andy Griffith Show” in the song “Floyd the Barber,” from Nirvana’s 1989 debut, Bleach. Here, the narrator walks into Floyd’s Barbershop for a shave and instead ends up being graphically molested. Unlike “Me ‘n’ Opie,” there is no sense of playfulness or admiration for the innocence of the fictional Mayberry. One must presume the shock value of having dark and disturbing things happen in America’s collective quintessential small town is some sort of statement about the realities of modern life, or perhaps the hypocrisy of the small town ideal, yet the effort falls flat. Listening to “Floyd the Barber” some 20 years later, Cobain’s juxtaposition of Mayberry and all it represents with a disturbing sexual assault comes off as lazy, heavy-handed and obvious. Ironically, the original “Andy Griffith Show” some 50 years later suffers from none of these weaknesses. Keep in mind this is an artist who brought Appalachian music into the living rooms of the grunge generation by closing Nirvana’s acclaimed 1993 MTV Unplugged set with a brilliant cover of “Where Did You Sleep Last Night” (popularized by Lead Belly and the Father of Bluegrass, Bill Monroe, under the title “In the Pines”). To Cobain’s credit, he reportedly never cared much for the lyrics to “Floyd the Barber,” which were hastily scribbled down the night before the recording session and while in a bad mood. The point is, even the most cynical of us can find something worthwhile in the world Andy Griffith created. Yes, even foul-mouthed, pot smoking honky-tonk bar musicians can find sentiments worth celebrating in that mythic land of Mayberry. Each of us (and anyone who has spent any time in the American South, especially) can relate in some way to the eccentric characters that, in my experiences at least, are not exaggerated much beyond real life, if at all. Andy’s Zen-like approach to parenting and policing isn’t cornpone and worthy of ridicule. It is admirable consistency in the face of a chaotic world; and while doing the right thing was a weekly lesson, it was never so at the expense of having fun. Pickin’ and a-grinnin’ was foremost, and the latter always followed the former. Andy Griffith taught us not just to be cognizant of the right and wrong in our actions, but to also enjoy life daily. The opening to “The Andy Griffith Show” does not start with a Sunday sermon or a stern lecture; it starts with a father and son taking a break from the day to go fishing. Matt Powell is a writer, musician, lawyer and entrepreneur living in Venice Beach, California. He has a Bachelor of Music from Berklee College of Music in Boston and a Juris Doctor from Loyola Law School, Los Angeles. He is the guitarist and songwriter for The Incredible Heavies and The Sharbettes, as well as the co-founder and designer at Plecas Powell Design, a mid-century modern furniture design company. He often writes about music as a means to explore the interconnectivity of broader issues and themes. Nice piece. I have not seen an episode in many years ( although saw them all and I imagine some several times) and did not recall The Darlings/The Dillards so it was interesting to read about them in connection with the show.